Silverfish and firebrats are small, wingless insects. Their bodies are flattened, carrot-shaped, and most always covered with scales. Silverfish and firebrats are characterized by two long antennae attached to the head and three long tail-like appendages that project from the tip of the abdomen. Adult silverfish are about ½ - ¾” in length with light gray, dark gray or silver-colored scales, depending on the species. Adult firebrats are about ½” in length and can be gray in color, but usually the scales are brown and mottled in appearance. The nymphs look similar to the adults but are a whitish color. The flattened bodies of these insects allow them hide in very small cracks and crevices. A silverfish female may lay over 100 eggs during her lifetime. Eggs are laid singly or in small groups, hatching in three to six weeks. 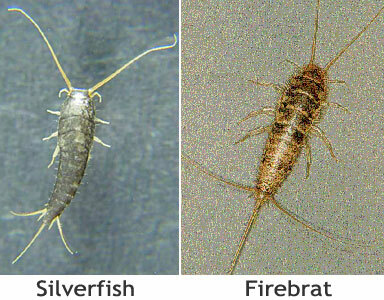 Young silverfish and firebrats resemble adults except being smaller and more white in beofre taking on the on the adult color in four to six weeks. Adults may live two to eight years. Firebrats lay about 50 eggs at one time in several batches. Eggs hatch in about two weeks under ideal conditions. Unlike other insects, silverfish and firebrats continue to grow and molt throughout their lives. Silverfish and firebrats feed on many types of paper and fabric. They are particularly attracted to glazed paper or material used in book bindings, which may include starch, glues, or other materials. These insects also feed on carbohydrates and foods high in protein, such as dried beef. Often the first indication of a silverfish or firebrat infestation is the evidence they leave behind. Book bindings that are attacked by silverfish or firebrats may have ragged edges or markings on the bindings. Silverfish and firebrats may also leave cast skins, scales, and/or feces on attacked materials.